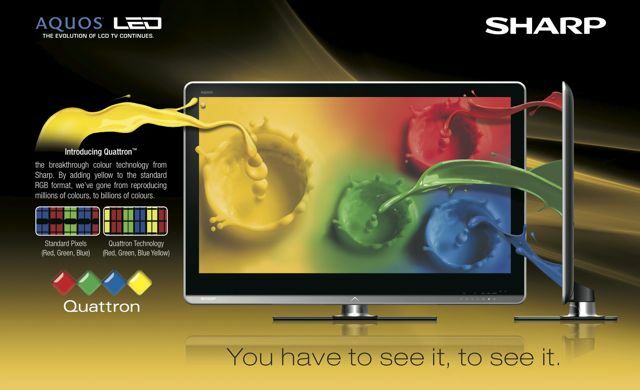 With the introduction of the LE820 Series, Sharp once again establishes its leadership in LCD and LED technology. In a monumental engineering breakthrough, Sharp’s proprietary Quattron Technology, a 4-colour filter that adds yellow to the traditional RGB, enables more than a trillion colours to be displayed for the first time. A stunning new contemporary edge-light design with full-front glass proudly announces a new AQUOS direction for 2010. The proprietary AQUOS LED system comprised of the X-Gen LCD panel and UltraBrilliant LEDs enables an incredible dynamic contrast ratio of 5,000,000:1 and picture quality that is second to none. The LE820 series is very fully featured, including the addition of Netflix™ streaming video capability through the AQUOS Net™ service, along with the industry’s leading online support system, AQUOS Advantage Live. A built in media player allows for playback of music and photos via USB port. You really do have to see it, to see it. You can only watch 3D with a 3D TV: This is wrong. 3D-ready TVs are the top-of-the-line models for most manufacturers, but they are first and foremost, regular 2D TVs. You can watch everything you would with any other LCD or plasma display, in standard 2D fashion. There's just the added benefit of being able to also watch 3D content should you wish to do so, and when it becomes available. Even if you never watch 3D content, the latest models represent the best of the best in current lineups. The price is high: True, 3D-ready displays are slightly higher in price than other TVs on the market. But note that you're not just paying for 3D capability, and the ability for the displays to communicate with 3D glasses. You're also paying for advanced features like, in many cases, LED backlighting, which affords a better picture, thinner design, and less energy consumption. There are also features like Internet connectivity, and faster refresh rates for better producing fast action scenes without the issue of motion blur. Bottom line: you're paying for a premium TV, not just for a 3D TV. You can watch anything in 3D: While some companies, like Toshiba, are claiming to offer technologies that will allow you to convert any 2D program to 3D for viewing (by splitting the image in two, essentially), the 3D technology you're hearing about most requires active shutter glasses that are somewhat pricy, but that offer better separation between the image you see in the left and right eyes, flickering it rapidly and in alternating fashion to avoid seeing double. These run on batteries and can communicate with a separate transmitter you connect to the TV (or with technology built into the TV itself.) Passive glasses are the cheaper version you are likely more familiar with that require double images on the screen, where you see one in each eye to create the perception of depth. They result in an image that isn't as realistic and enticing, and can also lead to some motion sickness, so to speak. If you caught the Michael Jackson tribute at the Grammy Awards this year that was offered in 3D, or you watched Avatar at the theatre, you'll note that you were using passive glasses. Most manufacturers are supporting the active format, although some, like LG, say they will offer TVs that support a passive system as well. You need to buy all new equipment: This is true. Watching 3D content requires, of course, a flat-panel TV that's capable of playing back 3D content, and communicating with partner glasses. Thus, you also need 3D glasses; some manufacturers, like Samsung, will be bundling a few pairs (for a limited time, at least) with the purchase of a 3D-ready LCD or plasma and Blu-ray player. But for the most part, you'll need to buy them separately. Pricing is still up in the air, but they could run anywhere from $100-$250 per pair. Speaking of Blu-ray, you'll also need a source device. While companies like DirecTV and Discovery Channel plan to offer 3D broadcasts later this year and into 2011, initially, you'll need a 3D-capable Blu-ray player to enjoy content. Following from this is of course the 3D Blu-ray disc to insert into the player. Monsters vs. Aliens will be the first title to be released on 3D Blu-ray, but we can expect more to become available, like Cloudy With a Chance of Meatballs, and, of course, Avatar. Finally, the last part of the equation is an HDMI 1.4 cable. There has been some confusion regarding cables and whether an HDMI 1.4 cable is required to watch 3D content. I have confirmed with HDMI Licensing, LLC that only a "high-speed" HDMI cable is required, regardless of which specification. According to the organization, HDMI cable manufacturers are no longer permitted to use the numbers to market their products. HDMI cables should fall under only two categories: standard and high-speed. That means that as long as a cable is "high speed", it should be able to carry the full 1080p 3D signal. Bottom line: if you have a cable labeled "HDMI 1.3", it can indeed be used to transmit a 3D signal, as long as it's "high speed". HDMI Licensing claims that an A/V receiver based on HDMI 1.3 "may or may not" be able to pass a 3D signal, but would require a firmware upgrade. Bottom line: you won't know for sure until you try. 3D is pie in the sky and isn't ready yet: 3D is very much ready. I've seen it for myself! And we will see products at retail as early as the end of this month and into the summer of this year. Content is also abundant and coming. I mentioned Monsters vs. Aliens and Avatar already. Disney may be releasing The Lion King in 3D next year;. ESPN will launch a 3D version by June, kicking off with a World Cup soccer match between South Africa and Mexico. Discovery is going to launch a 3D channel in 2011, and that includes Canada. DirecTV in the U.S. will carry three 3D channels this summer that require only a free software upgrade from consumers. One will include the Baseball All Stars Game. It'll include movies and documentaries. You can watch any 3D TV with any pair of glasses: This is not true. With active shutter glasses, each is specific to the TV manufacturer, so not every pair will work with every 3D TV.) It's similar to video game systems: you can't use a Wii controller with the PlayStation 3, for example. It is possible, however, that third-party companies could make glasses that work with a variety of 3DTVs. You have to wear the glasses to watch regular TV: It sounds silly, but plenty of people believe that the glasses need to be worn to watch anything on a 3D TV. Remember: 3D TVs are just regular 2D TVs that can also play back 3D content when you want to watch it. When you don't, they function just like standard TVs; they just look much nicer! However, if you want to watch 3D content then yes, you do need to wear the glasses. 3D is cheesy: If you think back to the fun amusement park rides and 3D content of yesteryear, you're bound to view 3D as just a cheesy way of watching movies that looks artificial and in-your-face. 3D has come a long way, and many of the demos I've seen look spectacular. 3D adds depth to the picture and, in some cases, like with sports or action movies, you feel like you're right in the action. With animation, it adds a fun element to the viewing experience. It has a realistic quality to it that really draws you in, much like high-definition does with a hockey game or frightening scene in a horror movie. It represents another level; a step above HD. 3D is easy to integrate for broadcasters: You might think it's a simple process, so why aren't broadcasters on the ball? 3D uses about twice the amount of spectrum that a regular TV channel uses, which poses obvious issues for broadcasters. But they are indeed actively looking into offering content. In Canada, Rogers has said that it may even launch a 3D demo channel this year. You'll be able to watch 3D content through a PlayStation 3: This is true. Sony has confirmed that all that will be required is a firmware upgrade for the popular gaming console to be able to support 3D Blu-ray discs. In fact, the company is already demonstrating 3D gaming through a PS3 at select Sony Style locations in Canada. I am very excited to welcome Lutron Electronics into our line card. Lutron offers a complete line of lighting control solutions for residences as well as for commercial projects. Light control is the ability to adjust the amount of daylight and electric light in a room or throughout your whole home or business. With Lutron, you can adjust the amount of daylight with electronically controlled shades and drapes, and electric lights with dimmers and switches. And you can conveniently control it all with keypads, sensors, and other light control devices to create the perfect balance of daylight and electric light to suit your lifestyle. So whether you are a homeowner seeking to enhance the appearance or atmosphere of a single room, or a facilities manager looking to enhance employee productivity and comfort while reducing energy-related costs throughout an entire corporate campus, Lutron can offer you the best value lighting control solutions that will meet or exceed your expectations while staying within your budget. Contact me today and I’ll help you see your world in a different light! In a third year in a row, we have once again been awarded the honour of being a Premium Control 4 Gold Dealer. This highlights us as a custom integration dealer who specialize in automation and have achieved key training, sales and experience requirements in Control4 products. “Control4 Premier Gold Dealers are uniquely qualified to make your life Everyday Easy.” We could not have achieved this designation without the support of our clients. Finally. An iPod dock that does it all! Introducing the all new iPort FS-23 free-standing iPod/iPhone dock. 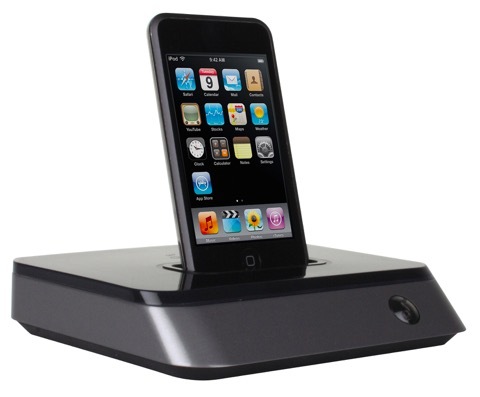 This dock transforms your iPod or iPhone into a Digital Media System with On-Screen Navigation. Besides standing out as dock that connects to your TV with a full GUI (Graphical User Interface), the dock connects to your local network! This virtually allows you to sync you iPod or iPhone over your network without having to dock it directly to your computer. The advantages of a network connection can be quickly realized. You basically have a very inexpensive Media Server and fully unlocks your media even if they are DRM protected. It also has a remote zone IR control input so that the FS-23 Dock can be controlled from any room with several different control devices including Control4 or a Harmony Remote. Connects to your TV via component cables to give you the most optimized video playback of your Movies, TV Shows or Photos. Audio can be connected to your Hi-Fi system or directly to the TV for rich sound. •	View an elegant Now Playing screen that indicates title, artist, and album with cover art provided by the iPod/ iPod touch.